Thanks for noticing Punday and Chilly Clematis. This one of yours caught my eye (being Canadian had almost nothing to do with it). Thanks, the first sight of the geese in the spring is always so cheering and sweet, I quite forget what I was thinking. And then in the fall, the arrows flying south is bittersweet, but exciting. The usually leave right before the first snowflakes fall. I just looked at your site and could not figure out which city. If you don’t mind saying so, which city is home? Ah, yes! I love NYC but nature is hard to find! Thanks for taking the time to pop over to ADDandSoMuchMore to read “Top Ten LOUSY Product Designs . . .” (and especially for “liking” it to let me know you’d been there). Given how I found you, I was expecting to find a fairy tale once I landed. I was delighted by what I found instead. Ever since I tripped across The Goose Story by Dr. Harry Clarke Noyes, many years ago now, it has been my North Star — so I was thrilled to see the picture and to read the haiku. Always far too wordy for the form, I have written only one (an assignment). It’s not bad, but I’ve never been called to do it again — and especially not after reading the dueling haiku here! The Goose Story is on my blog, if you’re not familiar with it. It is introduced by “About Values and The Goose Story,” which details why it is special to me. The link to the verse is at the bottom of that post. After more than 25 years, it still inspires me to read it. It’s almost dawn and I simply MUST put myself to bed, but I plan to add a link to this post at the bottom of that one as soon as I cross a couple of things off my list otherwise. I’ll ping you when it goes live — or leave a comment, if you don’t have pings enabled. Believe it or not, I’m being the “up all night again go to bed when daylight hits” person this morning. It’s slightly after 9AM EST – and I’m finally off to bed. So I’ll be back later in the late afternoon to see if your team won 🙂 and whether you liked the Goose Story. as my momma goose decided to build her nest outside my cottage door, she has been setting on it for 6 days now.. Recently a 10 year old I was talking to asked what poetry was…. it would be very sad if this ancient form of story telling was lost – Friendly Fairy Tales helps keep it alive and also brings nature to life. Beautiful. 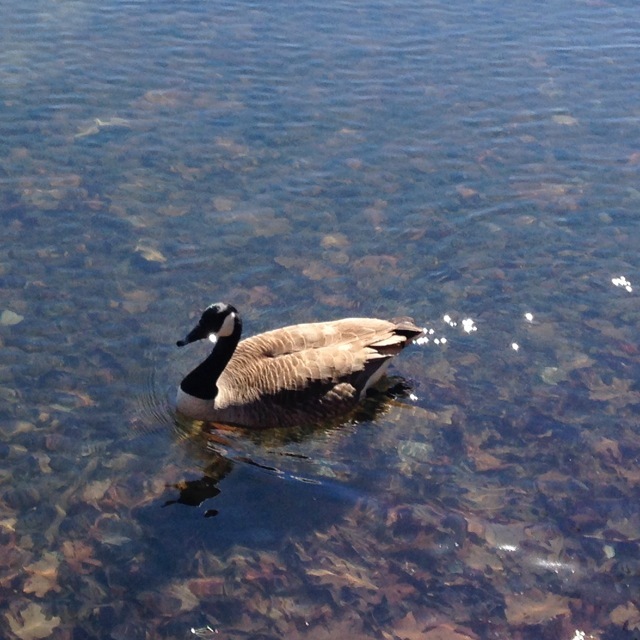 I love the Canada geese. We have them here. Yes, and I love watch them process along the river or lake. I love to hear them honk honk when they leave in the Fall too., flying in a perfect V. When I lived in Toronto I liked them less…there are soooo many. Hey hold up traffic sometimes…literally crossing the street in the West part where I lived near Humber Park. But since I have come back to Quebec I like them again…hehe. Yes, the big flocks can make a mess of the green areas, but I love them as heralds of spring. It’s funny, I notice them more in the Fall but I am closer to the city now so I miss this. I love when they arrive, because then winter is surely over. 🙂 Honk! Honk! Thanks for adding to the fun!